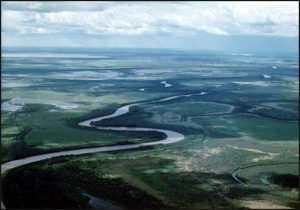 Wood Buffalo National Park is the largest National Park of Canada at 44,807 km². It is located in northeastern Alberta and the southern Northwest Territories. Larger in area than Switzerland, it is the second-largest national park in the world and home to the world’s largest free-roaming herd of Bison. The scope of work involved 30.6 km. of notching, widening with granular subbase, complete coverage with GBC and a double seal coat to be placed as the final wearing surface. Major challenges included being able to mobilize to the site due to access restrictions on the only summer haul route to the work site. Much of the gear had to be barged in to ensure we met our anticipated schedule. Carmacks also supplied all survey, testing and environmental controls to meet all administrative requirements for the project. Construction was completed earlier than estimated due to good weather and the hard work and dedication of our base crew.